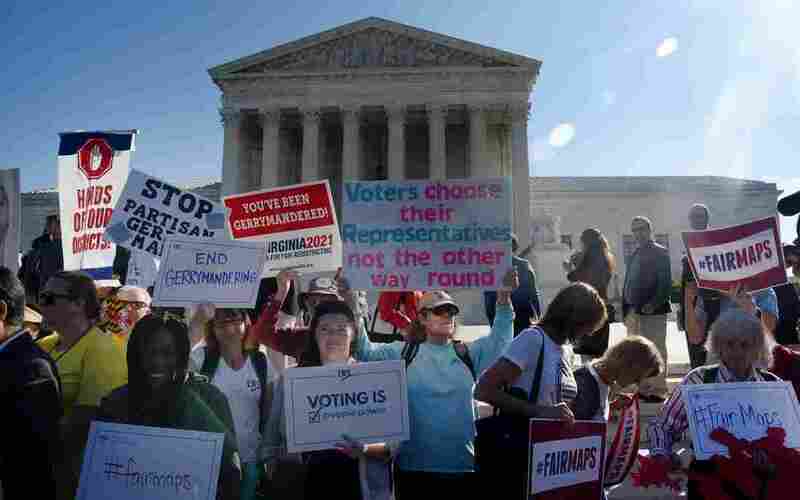 Demonstrators protest partisan redistricting in 2017 during oral arguments in a case out of Wisconsin. A year and a pivotal justice’s retirement after the high court dodged the question, those seeking to break the political stranglehold over legislative redistricting, are urging the justices to draw a line beyond which the Republican and Democratic parties cannot go in entrenching their political power, sometimes for decades at a time. Two cases are before the court Tuesday. One from Maryland, where Democrats drew new district lines to eliminate one of the state’s two GOP seats in the U.S. House of Representatives. The other is from North Carolina, where it was Republicans who drew maps to strengthen their political power. For nearly two decades, people have been challenging partisan redistricting as unconstitutional, arguing that, at some point, enough is enough. In 2004, the Supreme Court divided 5-to-4 in dismissing a claim on procedural grounds. The decisive fifth vote was cast by Justice Anthony Kennedy, who explicitly left the door open to striking down future partisan gerrymanders if “a manageable standard” could be found for courts to apply. “Technology is both a threat and a promise,” he wrote, noting that with the advent of computer technology, the temptation to leverage partisan advantage would “only grow” unless constrained by the courts. His hope, he wrote, was that “new technologies may produce new methods of analysis” for the courts to use in identifying and remedying the problem. But Kennedy retired last summer and was replaced by the far more conservative Justice Brett Kavanaugh. That leaves the odds heavily against those challenging partisan gerrymanders. Uphill battle or not, it’s game on Tuesday, with the focus mainly on North Carolina. There, the statewide vote is split roughly equally between Democratic and Republican voters, but the Republican-controlled state legislature, in drawing the current congressional district lines, deliberately and openly drew them to maximize the GOP advantage. The openness of the Republican partisanship was at least, in part, because a previous, and similar gerrymander had been struck down as an unconstitutional racial gerrymander. That’s when the drawers of the lines either pack in voters of the opposition party in one place to maximize their own power in other parts of the state or crack them and spread them out to dilute their strength. In North Carolina, the Republicans packed as many Democrats as they could into three districts, and then cracked other Democratic districts in half or in thirds, so that the Democratic vote would be diminished in safe Republican districts. By splitting up predominantly Democratic Greensboro, she notes, half the dorms at the historically black North Carolina A&T campus were put into one GOP district and half in another. The League, Common Cause and voters in every district challenged the redistricting and won in the lower courts. But the Supreme Court blocked that ruling from going into effect and agreed to review the case. For lawyer Emmet Bondurant, who represents those challenging the redistricting, this is not a new fight. In 1964, at age 26, he argued before the Supreme Court that the one-person, one-vote principle should apply to congressional districts. Now 82, Bondurant will tell the justices that while the original one-person, one- vote cases were about requiring legislative districts to be equal in population, this case is about ensuring that a representational democracy works as intended. With extreme partisan gerrymanders and no chance of winning in most districts, he argues, the party out of power can’t recruit good candidates, can’t raise money, or even interest its own voters in going to the polls. The only elections that actually matter in a district that is “so rigged,” he said, are primaries. The general election is “irrelevant.” And that, in turn, leads to further political polarization. “What clearer definition could you have to outlaw partisan gerrymandering?” he asks. Defending the Republican redistricting, lawyer Paul Clement also looks to the Elections Clause. “The framers of the Constitution very consciously gave the authority to draw districts and make other election regulations to political entities,” he notes, adding that partisanship in gerrymandering goes back 200 years. “Trying to say that a certain degree of political gerrymandering or partisan gerrymandering is too much is like trying to figure out how much gaming in a casino is too much,” he said. “I like that analogy,” an undaunted Bondurant retorted. In a state where gambling is illegal, he said, any casino would be illegal. But, of course, it is to some extent a matter of degree, counters the other side. Clement points out that in the one-person, one-vote cases, the Supreme Court eventually came up with a formula, a “right” answer — in state legislative districts the population had to be equal within 10 percent, while congressional districts had to be pretty close to dead-on equal. Among the criteria Bondurant is proposing this year is one that is easier to understand. It is that the North Carolina partisan gerrymander is, quite simply, an extreme statistical outlier. Bondurant points to studies conducted of alternative maps, as many as 24,000 alternative maps that statisticians drew, using the neutral factors like compact districts and respect for local boundaries. “The map that the state chose is more extreme than 99 percent of all the possible maps you could have drawn,” said Eric Lander, director of the Broad Institute at Harvard and MIT, who filed a brief in the case. Lander, is an expert in analyzing large data sets and a geneticist who was a principal mapper of the Human Genome Project. By comparing the North Carolina redistricting map to tens of thousands of maps generated by computers using neutral principles, he said, you can identify the extreme outliers. “Happily,” he said, North Carolina’s redistricting is “so extreme” that the court, for now, doesn’t have to go further in developing a standard. In the future, Lander acknowledged, the court would likely want to develop a broader range of extremity beyond which states could not go — 70, 80, 90 percent, for instance. That is what the court did in the 1960s and 70s in figuring out permissible population differentials. Nonetheless, the newly constituted conservative court majority may well want to stay out of what judges sometimes call “the political thicket.” And there are procedural ways the justices can avoid ruling in these cases if they want to. They could, for instance, say that none of the voters who challenged the North Carolina redistricting can show the kind of harm needed to to have “standing” in court to sue. But if not these voters, then who? “It may be that nobody has standing to bring these kinds of claims,” Clement contended. And he points to the Supreme Court’s refusal to hear challenges to the Vietnam War as an example of cases that could not get in the courthouse door, because nobody had standing to sue. Bondurant views that comparison as ridiculous. “If the court rules in favor of Mr. Clement, ” he said, “you are giving partisan state legislators what I will describe as a hunting license with no bag limits. And the results, he maintained, would be “catastrophic” for democracy.